It was another good week on Everest. While it was windy and snowy at times, overall teams on both sides did well. There was one accident on the Nepal side when a tall serac in the Icefall collapsed onto the route injuring two Sherpas. As we enter May, talk of summit dates will increase. It looks like the Nepal side may see the first summits, but we have a long way to go. Most teams will do two or three “rotations” to high camps in order to force the creation of red blood cells and other physiological changes needed to perform at extreme altitudes. Known as “climb high, sleep low” this has been the practice for most high altitude climbers for decades. Today a few will try to “pre-acclimatize” at home in altitude tents but most people use the old fashion way. Even those who use tents still need a rotation or two since they only get pre-adjusted to about 17,000’/5200m, even though some advocates will dispute this saying they go even higher. So this is what has been going on for the last two weeks. Most teams are back at their respective base camps this weekend resting up and growing red blood cells. Next up will be another rotation to Camp 3 on the Lhotse Face around 23,500’/7162m and to the North Col on the Tibet side at 23,000’/7000m. Hopefully the ropes will get to the summit on both sides in the next ten days allowing for member summits starting around May 11. 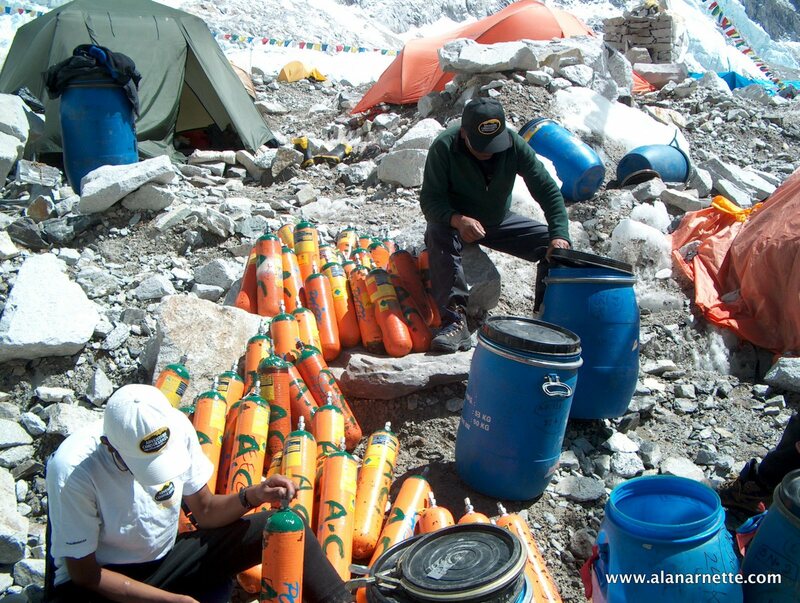 But for the 99% of climbers this season using supplemental oxygen, those bottles must be staged at Camp 4 on either side – and that takes a lot of work by the Sherpas. We’ve seen 148 patients so far, 57% are Nepali, 90% are men. As has been the experience for every single season in the past 15, we’ve been inundated with mainly respiratory issues as well as some gastroenteritis. Lucky we have Dr Subarna, a bone doc, who has been busy giving his expert care to lots of patients with musculoskeletal issues. We’ve now seen 3 cases of AMS in the last 2 days (1 in an ascending climber who skipped a couple of recommended acclimatization days en route.) We’ve facilitated 10 evacuations from base camp so far and have been missing sleep for the past 2 nights because of early morning accidents in the icefall. Luckily those patients suffered non life threatening injuries but were evacuated to Kathmandu for further care. As high camps become established, stakes are higher, our climbers get up into the very most extreme altitudes and we are ready to help them get there safely. Sun Yiquan (China), VIP member of Our Everest Expedition 2018. This year 14 Peak Expedition have 3 VIP members who will attempt to the summit world’s highest peak. Born on 31 Oct 1986, Mr. Sun is one of the most popular artist (painter) in China. Today on 28 April he reached to the basecamp (5364m). And who said that art history degree wasn’t worth anything? 🙂 Best of luck to them. 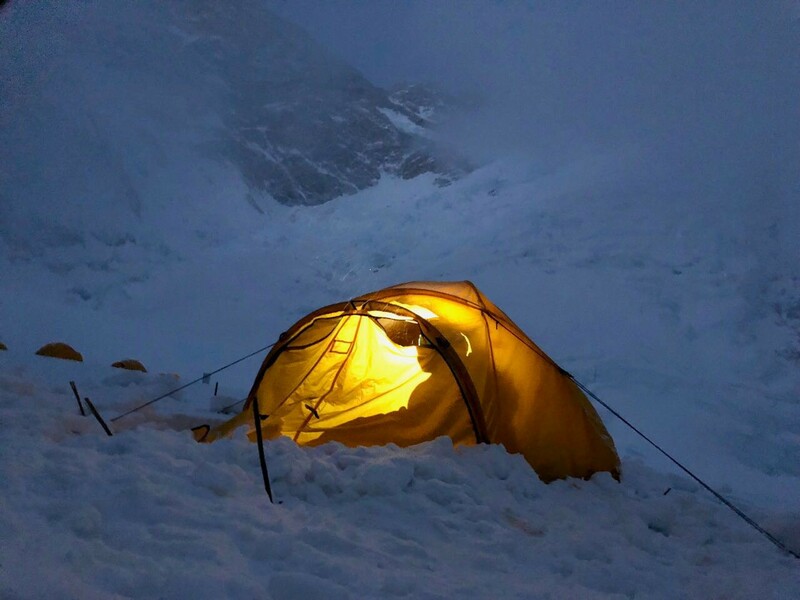 On the north side, teams have spent a few nights at Advanced Base Camp at 21300’/6492m. There are still teams just arriving at the Chinese Base Camp. 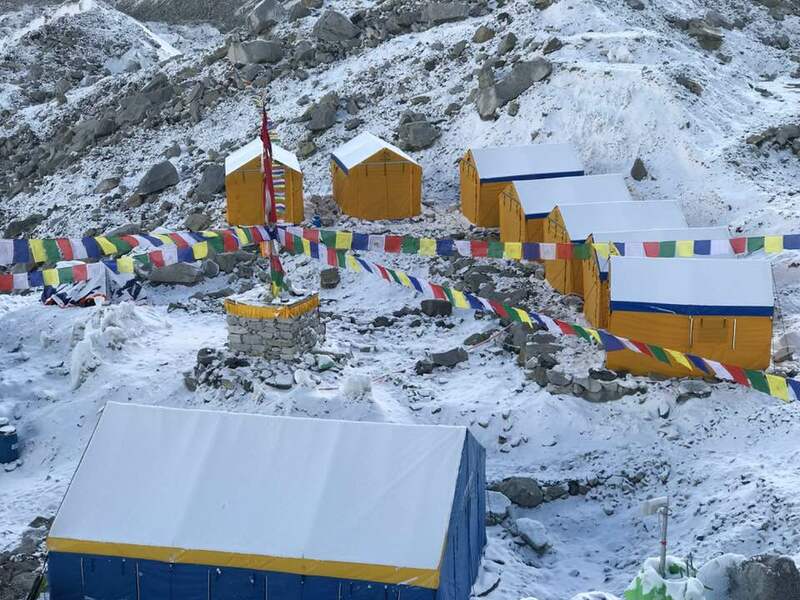 In general teams arrive a bit later on the Tibet side because they usually do one less acclimatization rotation because the camps are higher and the summit day is a bit shorter – for some. I like this picture Adventure Peaks posted of climbing to the North Col. Note the image was from last year but probably the same this time around. Let’s do a quick summary on the other 8000 meter peaks being climbed this spring season. There are 88 climbers for Lhotse this season. The ropes are fixed to the Lhotse Y thus opening the opportunity for a team to push for the summit soon. There are many climbers only seeking Lhotse this year so we may see a Lhotse summit before Everest. Both mountains share the same route almost to the Geneva Spur which is between Camps 3 and 4 (South Col). At that point you take a hard right (at the Y) and climb almost a direct route to the Lhotse Couloir then to the summit. As usual, there are few teams, about 15 people, on Cho in the spring season since most guides focus on Everest. We can expect to see Alpenglow as part of their Cho/Everest Flash combo, Kobler & Partner, perhaps Summit Climb and a couple of private teams including the Bulgarian Atanas Skatov. Rolfe Oostra with 360 Expeditions is also there and posted a cryptic message about problems with one Sherpa and losing a bag, but he says all is well. He now has a full update on Facebook. This peak is popular with serious mountaineers as it present a real challenge to summit in the best of conditions. There are 27 climbers this spring, 2018. German Thomas Lammle is there along with a three person Chinese team, and Peruvian Richard Hidalgo and Carina Ahlqvist . On the 22th we went out, about five in the morning, from the base camp (4.700 M), reaching, six hours later, field I (5.700 M), where we spent the night. The next day we went up to the field II Site (6.450 M) in four hours, coming down again, to sleep in field I. This morning we quickly descended into base camp. With this ascension we have completed our acclimatisation to the height and we are prepared to begin to think of an attempt to summit, when weather and mountain conditions permit. These kinds of mixed and changing conditions are why many climbers consider Kanch to be harder to climb than K2, and Mt Everest. Kanch is the 3rd highest mountain in the world but the route is long and winding in order to navigate all the crevasses and rock fall that presents itself up to Camp 4, with more challenges above Camp 4 to the summit. As you climb to the summit you have to zig zag the mountain – a lot – and before the true summit you have a very long traverse (along the summit ridge) where you do not gain much height. By comparison, K2 is quite direct on the Abruzzi route and Everest has a pretty consistent route on most of the mountain each year, plus a dedicated team to fix the route – we don’t have that here so co-operation and conciliation between teams is required. Chhiring, from Expedition Base (and Lakpa’s nephew) led about 80% of the route setting on Kanch in 2017. This year, it looks like he gets to share the load with a good deal of others. Many of the more technically challenging sections of the mountain are still ahead of where the ropes are fixed to currently so we still have many unknowns. Not many people on This, only about 10 or less. Maybe on a new route, Ines Papert and Luka Lindic from Slovenian-German are on Shisha. I’m covering Bulgarian Boyan Petrov while he is on Everest now but immediately after he plans to travel to Shisha and join up with Italians Mario Vielmo and Sebastiano Valentini, and Hungarian David Klein. There are eight people with permits on Manaslu but no names. And last but certainly not least is Korean Climber Hongbin Kim seemingly alone on Annapurna I.
Everest 2018: Stormy Future for Everest and the Other 8000ers? Love your coverage Alan. Anish just returned from ABC after touching the North Col. He is feeling great. He may or maynot do another rotation before Summit push on the North. curious why people think climbing with oxygen is cheating and using a rope to get to the top is not? Edie, it’s all about style. Critics will say ropes are considered safety and not an aid where others would say the opposite about oxygen. This is a debate that started with Mallory & Irvine in the 1920’s and will continue forever without resolution because it is an opinion. Climbing big mountains today is generally an individual sport with no real rules and few prizes, so the arguments a bit of a side show for most.